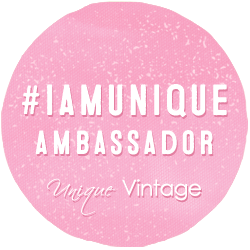 Hey guys, so lately I’ve been wanting to incorporate more of my interests into my blog, don’t worry I will still be doing fashion posts, but I thought it might be fun to share more about my first real passion: FOOD! I’ve always had a real love for food. I enjoy eating, cooking, and even shopping for ingredient, well not always shopping for them, weekend grocery store trips are a special kind of hell. But most of the time I do enjoy perusing the grocery store looking at ingredients wondering how I could change them into something incredible, another fun place to peruse for food inspiration is Pinterest. However Pinterest has some notoriously bad recipes so you know you’re always making a bit of gamble when you choose to tackle one. 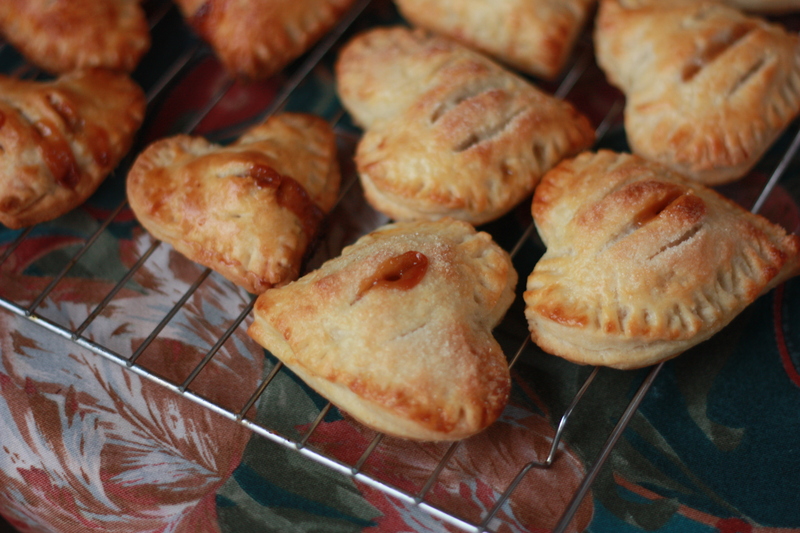 But I am happy to report the Caramel Apple Hand Pies recipe is fantastic! I needed to bring something to a potluck, and me being the wannabe Martha Stewart I am opted for individual pies, because they look Martha impressive but theyre simple enough for even the most basic baker. 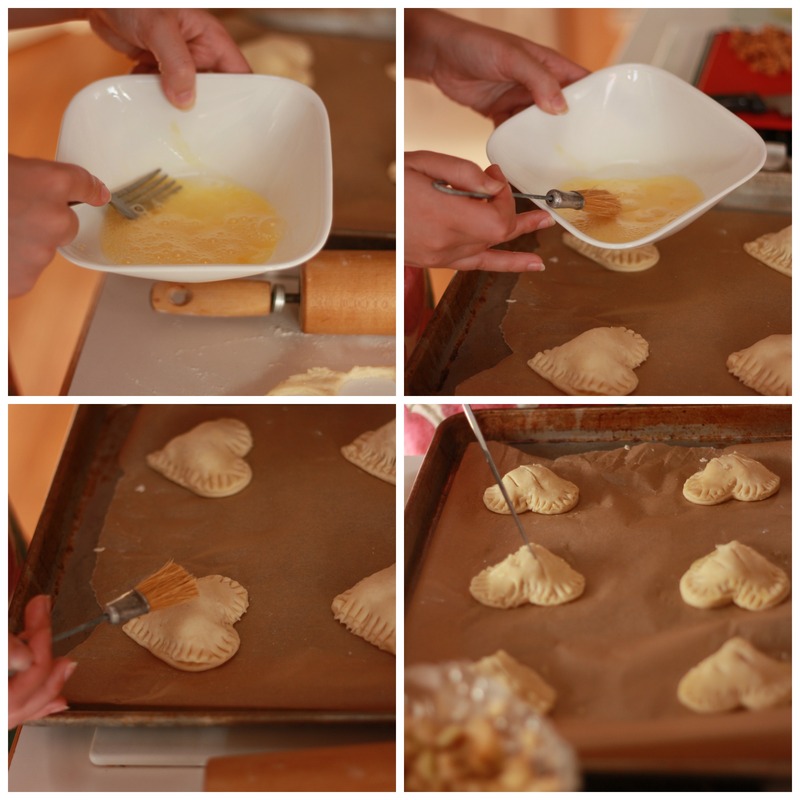 Start off by whisking all of your dry ingredients together, then cut in your butter, I usually prefer a pastry cutter but you can use a fork, whisk, or even your hands. 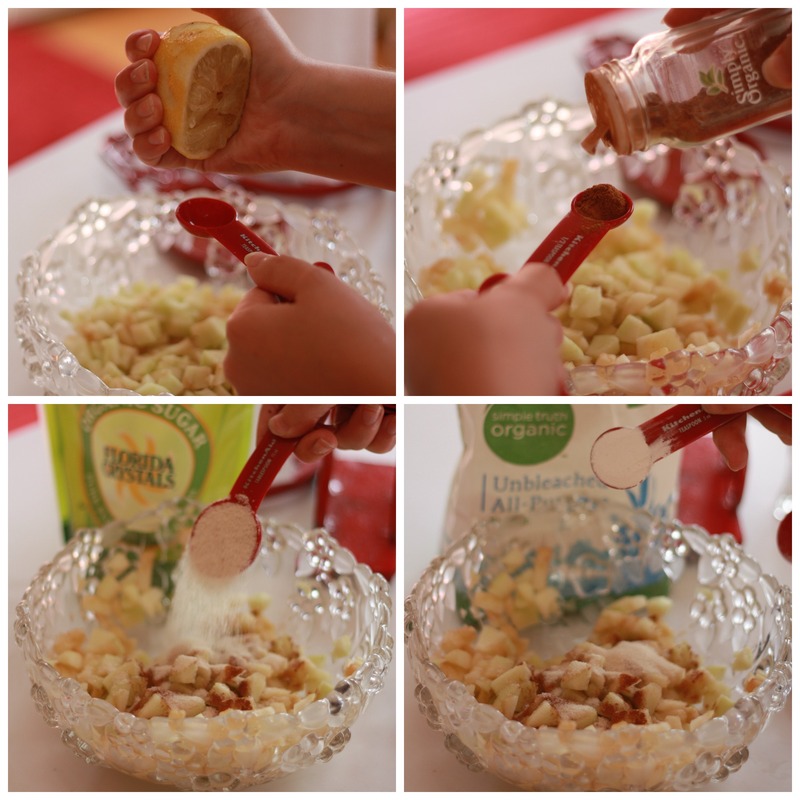 Cut in the butter til your mixture resembles wet sand, then stir in your sour cream. 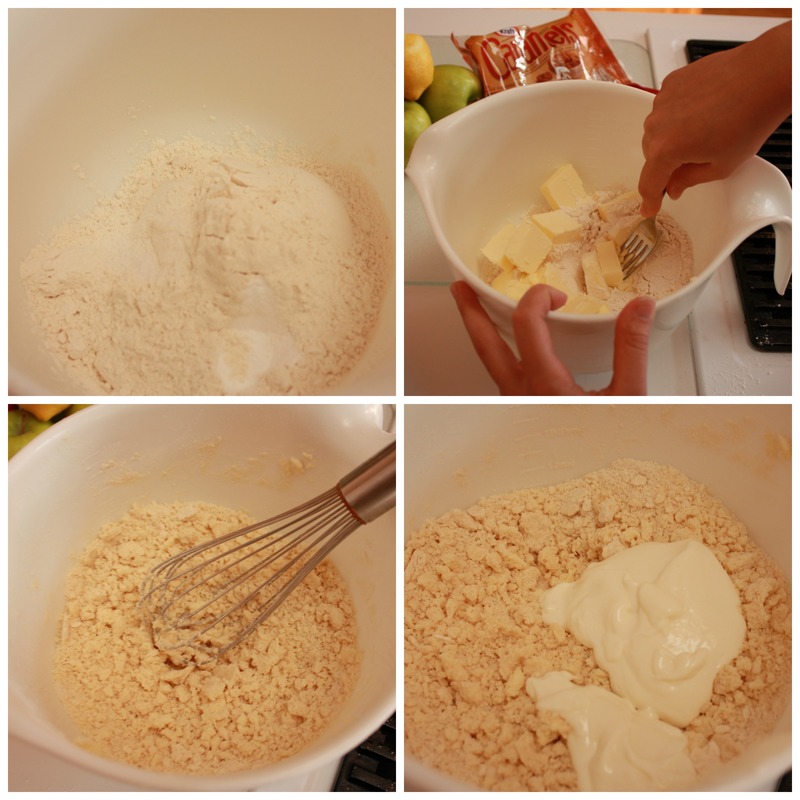 Once you’ve incorporated the sour cream turn dough out onto a well floured surface and knead til mixture comes together. 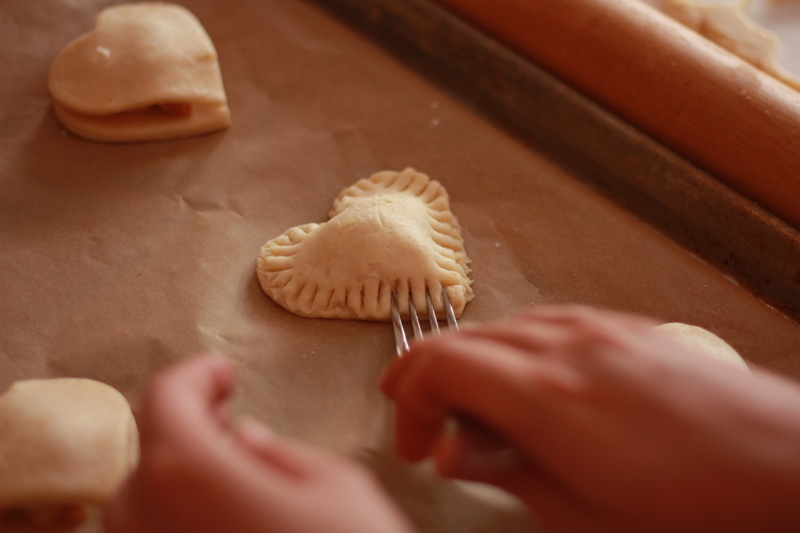 If the dough is too sticky to handle you can always add a little more flour. 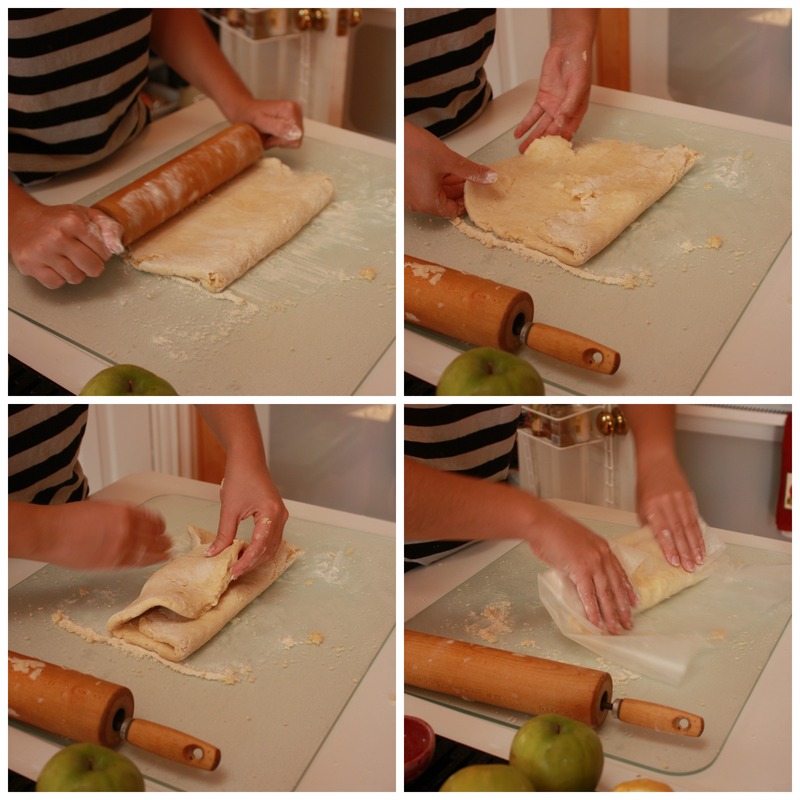 After you’ve finished kneading your dough, roll it out to an 8″ x 10″ rectangle, fold into into thirds, turn dough 90 degrees and roll it out again into an 8″ x 10″ rectangle and fold into thirds. Wrap your dough into cling film (I didn’t have any so I used wax paper and foil) and let chill in the refrigerator for 30 minutes while you prep your apple filling. Peel your apples, if you’re one of those people fancy enough to peel an apple in a single winding strip congratulations I am overcome with jealousy at your skills haha. 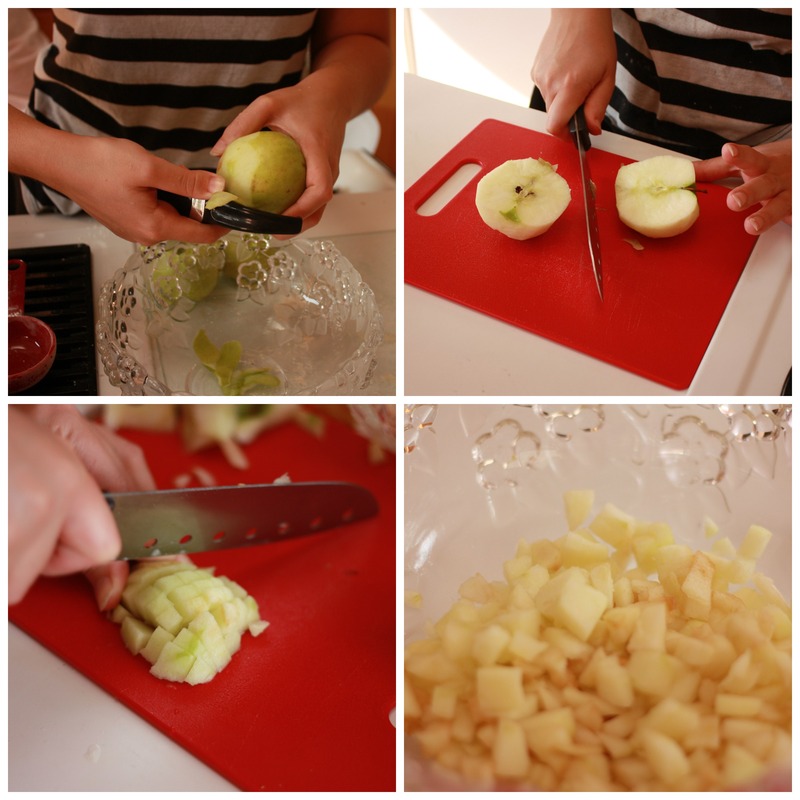 Once you’ve peeled your apples chop them into little cubes and place in a mixing bowl. As you can see my apple cubes are not as uniform as they ought to be…this is what happens when you need your knives sharpened. 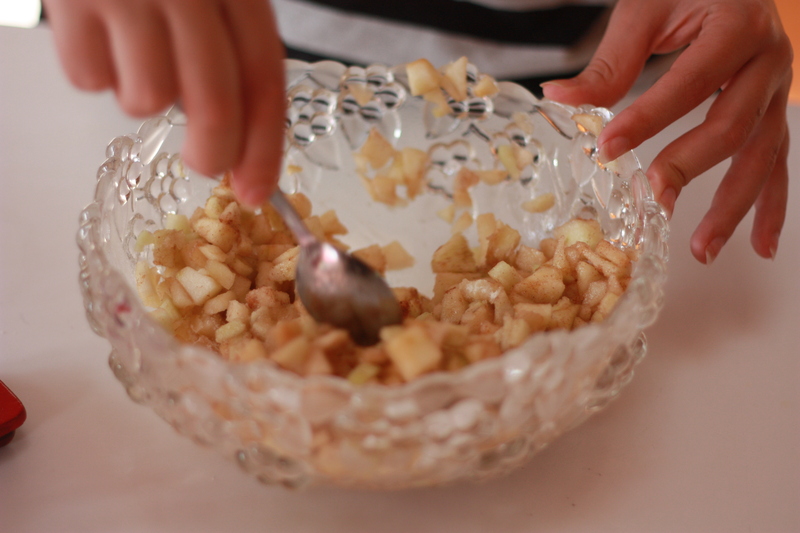 Then add your lemon, cinnamon, sugar, and flour to your apple filling. Stir thoroughly Preheat oven to 425 degrees Remove the dough from the fridge and roll it out to a 14″x 14″ square onto a well floured surface. 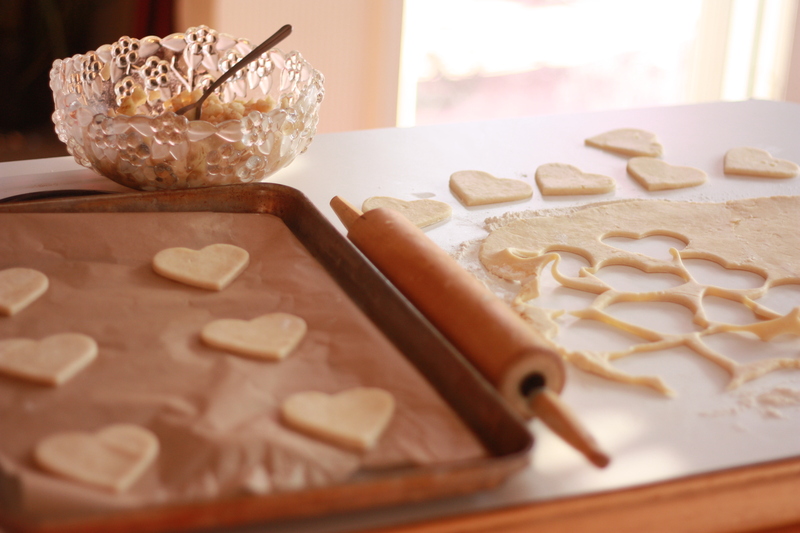 Then cut out your desired shapes, I opted to 3″ hearts, cut out as many pieces as possible. 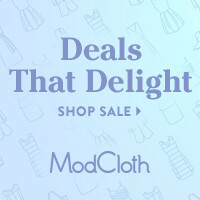 Re-roll the scrap dough and repeat the cutting process. 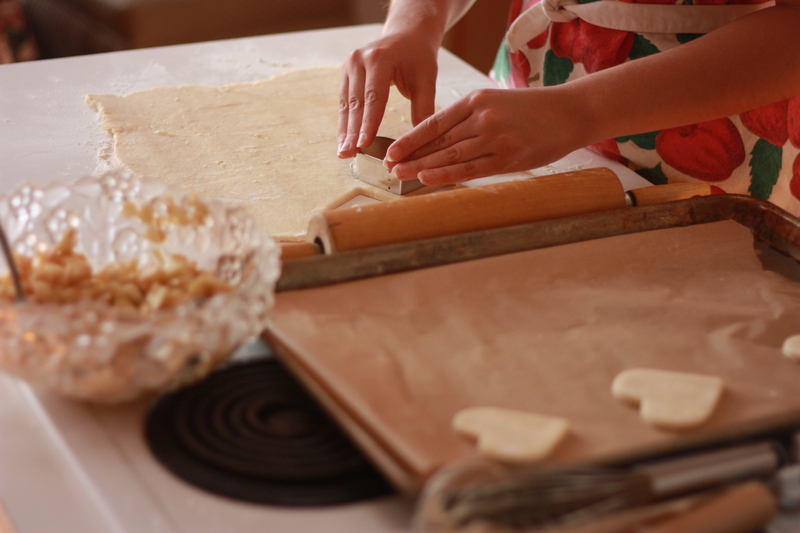 (you should have approximately 20 cut outs) Place 6 pieces of dough onto either a silpat or parchment paper lined cookie sheet. 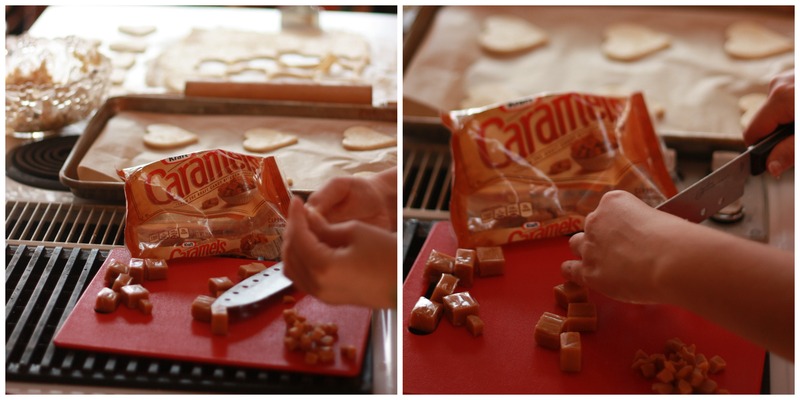 Unwrap your caramels and chop them into bits about the size of the apple pieces. 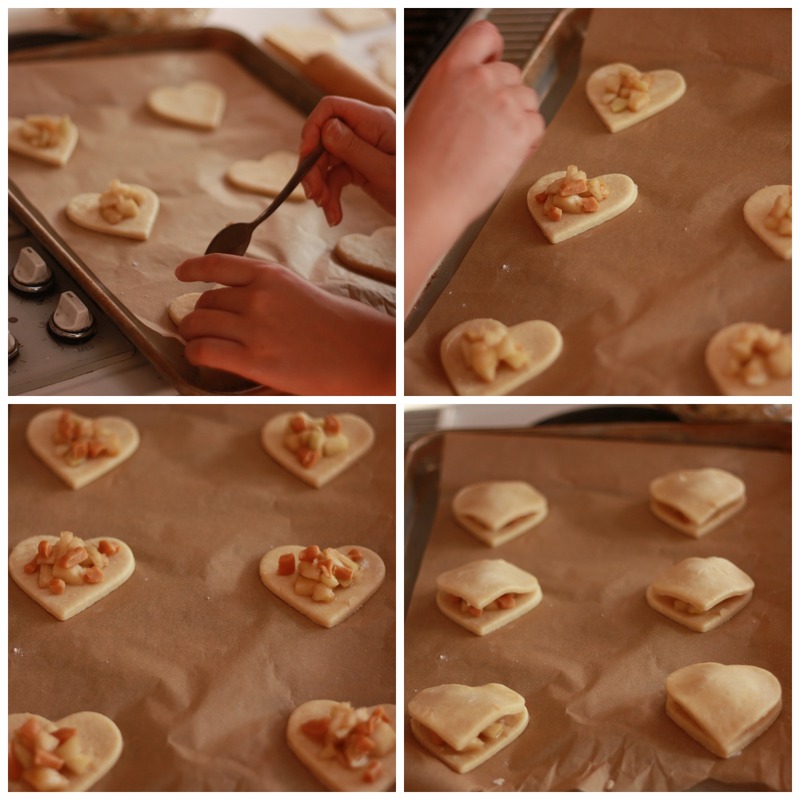 Spoon your apple mixture into the middle of your dough leaving enough room for the border, then add a sprinkling of your chopped caramels. The original recipe also called for a sprinkling of large flake sea salt but I opted not to, its whatever you prefer. 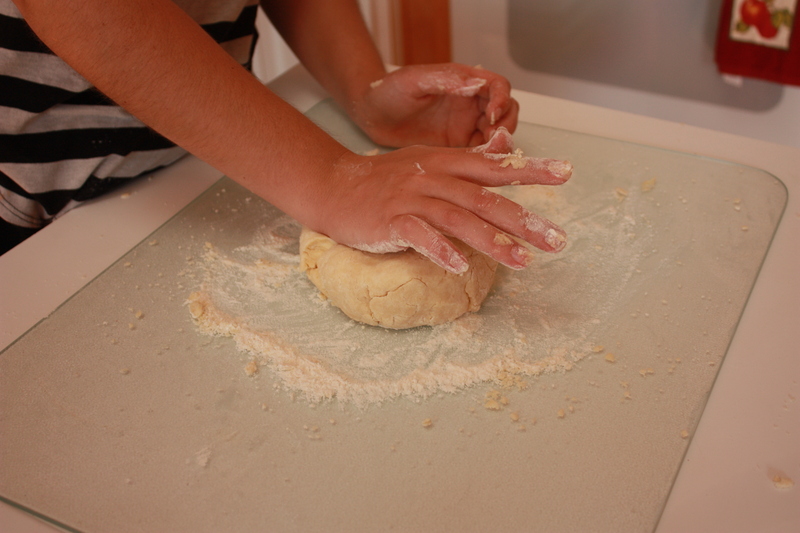 Then top your pies with a piece of dough. And crimp with a fork to ensure closure. 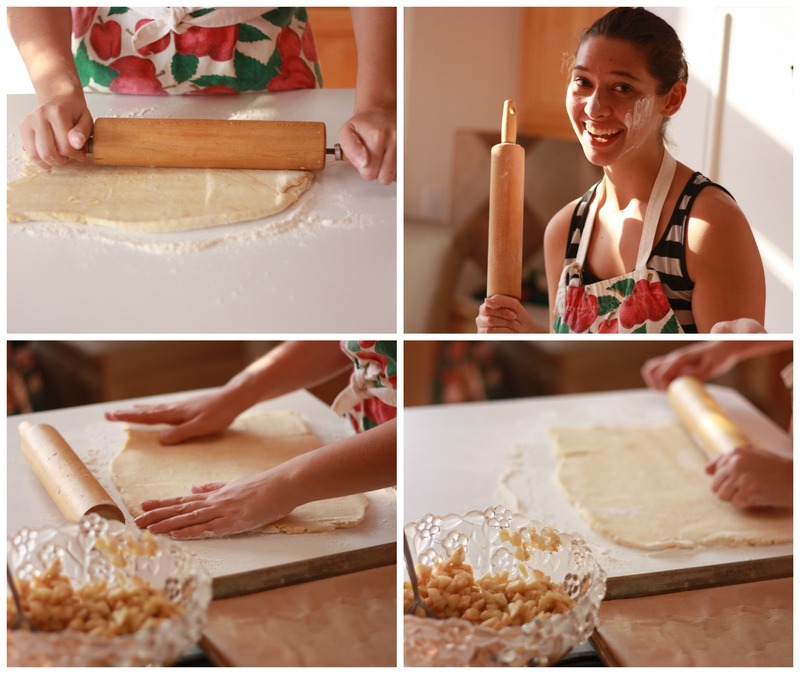 Then brush each pie with the egg wash mixture and make three slits in your pies with a sharp knife. 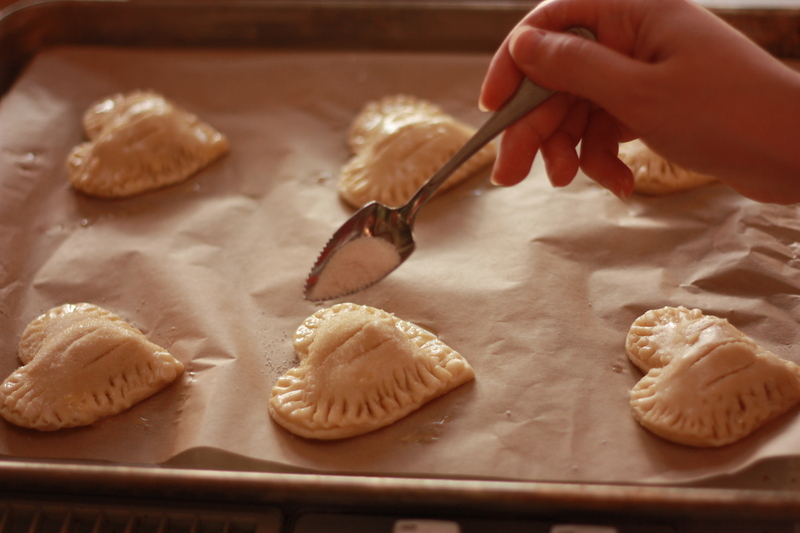 Top your pies with a sprinkling of sugar and bake for 15 minutes or until golden brown. 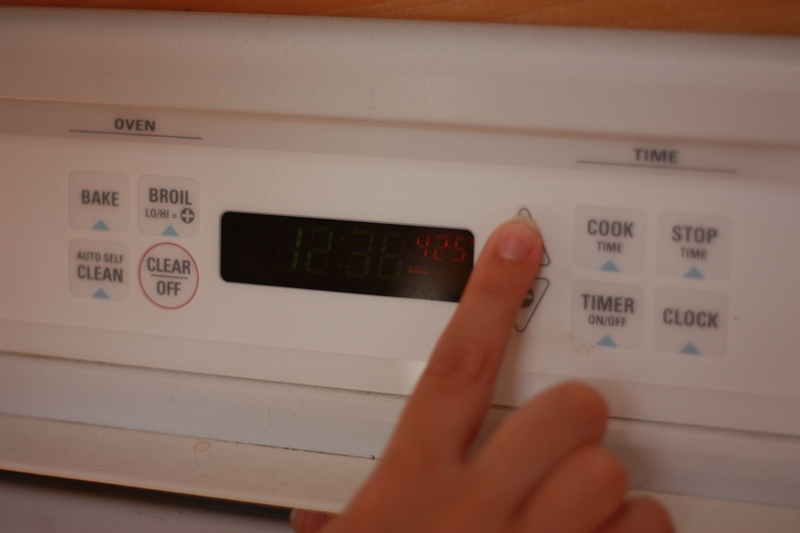 Allow to cool at least 10 minutes before serving and your done! 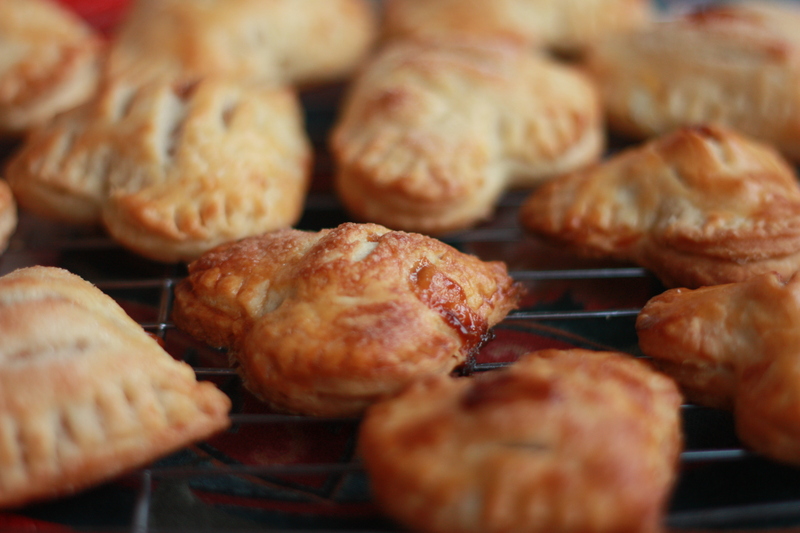 Everyone who had one of these pies loved em myself included, the crust was so delightfully flaky but not dry and sweet apple and caramel filling just knocks it out of the park so they’re a definite repeat. 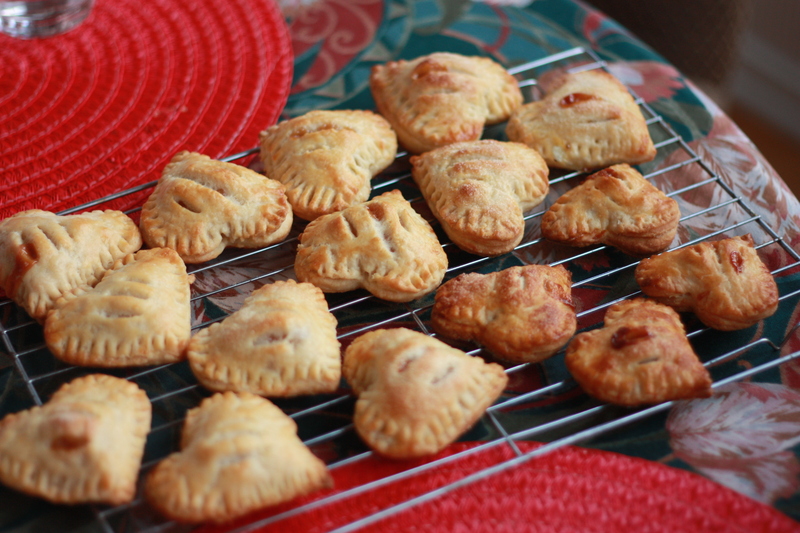 I would also like to experiment with different fillings or perhaps even pair them with ice cream! The possibilities are endless really. If you give em a try let me know how you like em! Happy Baking everyone! P.S. 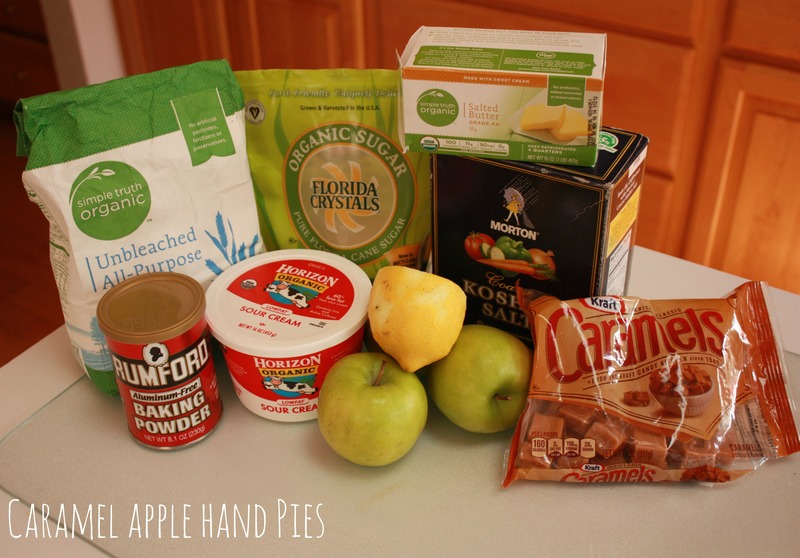 I had a bit of apple mixture left over and used it to top pancakes and oatmeal and both pairings were a big hit with my family, so if you end up with extra apples too you might also want to give these pairings a try.